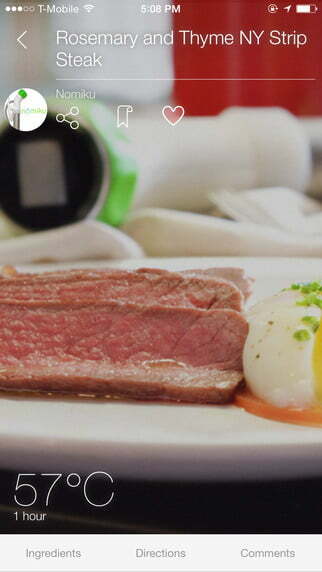 Precise and powerful, the Wi-Fi Nomiku serves up perfect sous vide in any kitchen. 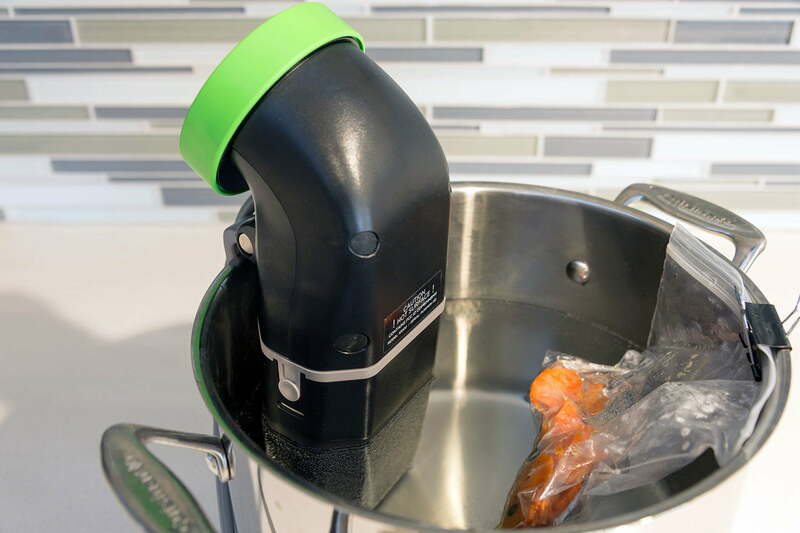 The first time we reviewed the Nomiku sous vide immersion circulator, we were impressed by its compact design. 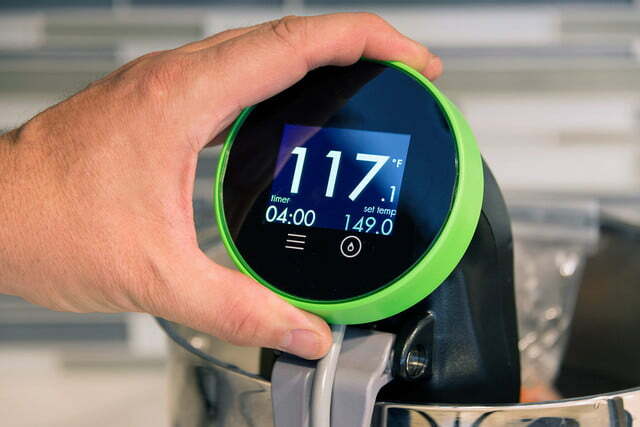 The new Wi-Fi Nomiku is a different kettle of cooked-by-temperature-control fish altogether. 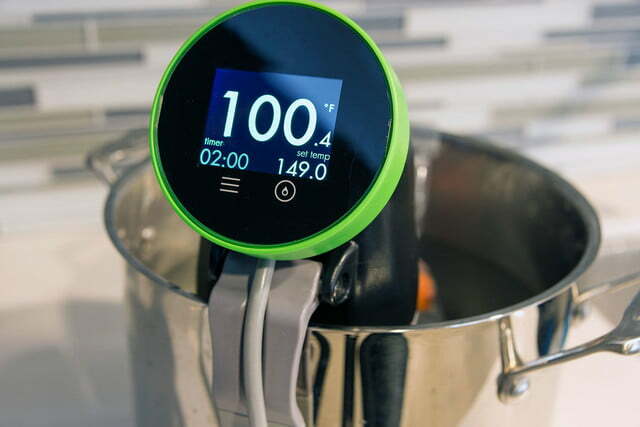 It’s bigger than its predecessor and adds connectivity and an app to help newbies get their sous vide on. But has do the new features improve upon the design or merely change it? If the original Nomiku looked a bit like a snorkel, the newer model is more like a periscope. The reason for the bulkier shape is because it no longer needs the power brick that came attached to the first circulator’s cord. The first Nomiku boasted UL certification, too; the Wi-Fi model is still waiting on that safety certification, which should happen in the next few months, according to the company. 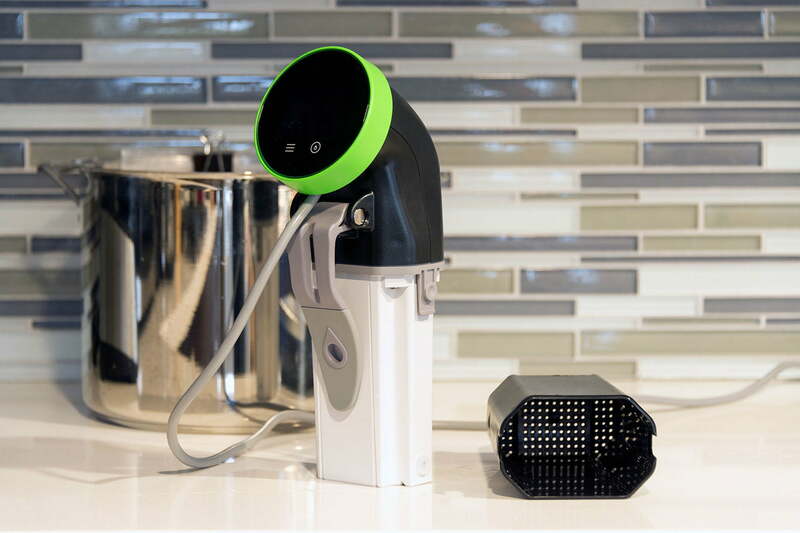 Made almost entirely of plastic, the Nomiku is black with a green, spinning dial at the top. This controls some of the functions on the 2.4-inch LCD screen, but there are also two menu and action buttons. 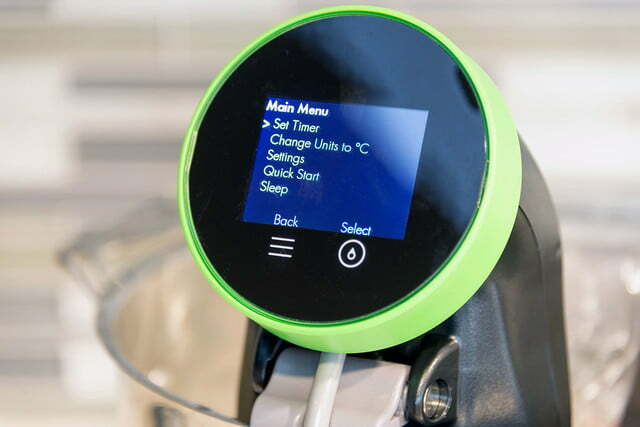 You’ll often set time and temperature through the Nomiku’s accompanying app, Tender (Android | iOS), but these controls come in handy if you want to quickly set up your own recipe. The Wi-Fi Nomiku is 4-by-3 inches and a foot high. Its plastic sheath is removable and can be put on the top rack of your dishwasher, but simultaneously pressing the two release buttons while pulling down on the piece of plastic sometimes proved a challenge. This version of Nomiku has some improvements over the other; its minimum and maximum water levels are much more forgiving, for example. You need between 1.5 and 5.5 inches of water to get cooking, which translated to between about 6 and 18 cups in a 6-quart stock pot. 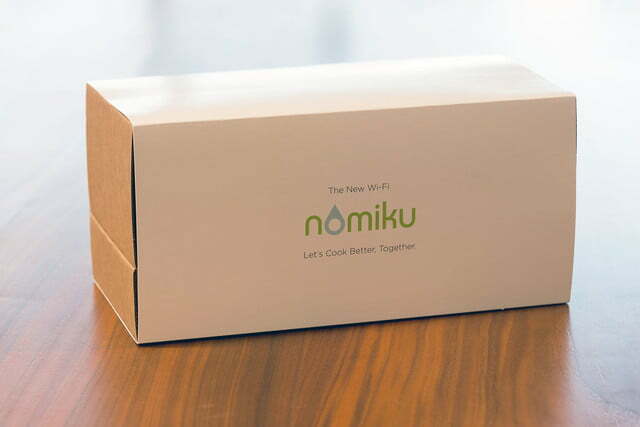 To get the Nomiku up and running, you need to add it to your Wi-Fi network. This necessitates downloading the app, then painstakingly — at least if you have a fairly secure password — turning the device’s green dial to key in each letter. The whole thing took about 10 minutes. 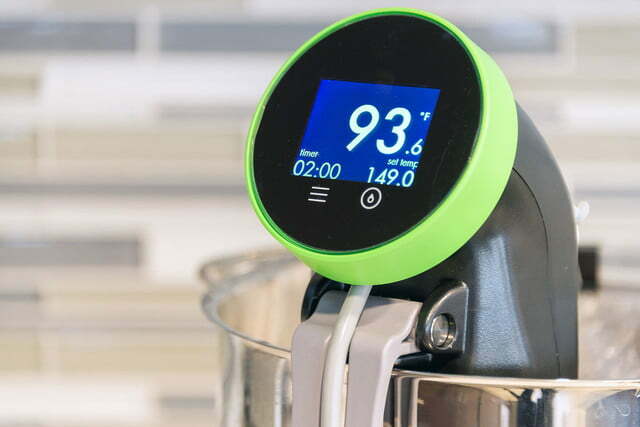 If you’re new to sous vide cooking, it’s essentially a high-end technique that has become more accessible with immersion circulators like Nomiku and Anova. The Nomiku works by clipping on to a container or pot, then drawing in water, heating it using an 1,100-watt ceramic heating element, and spitting it back out into the pot. That means you don’t need an external heat source, though you may want to put the pot on the stove to protect your counter. It tops out at 203 degrees Fahrenheit (95 degrees Celsius), so you won’t be boiling water with your Nomiku, not that you need to for sous vide. The Nomiku circulates at a rate of 7 liters per minute, and we found it took about 13 minutes to heat up 4 liters of water to 140 degrees Fahrenheit (60 degrees Celsius). 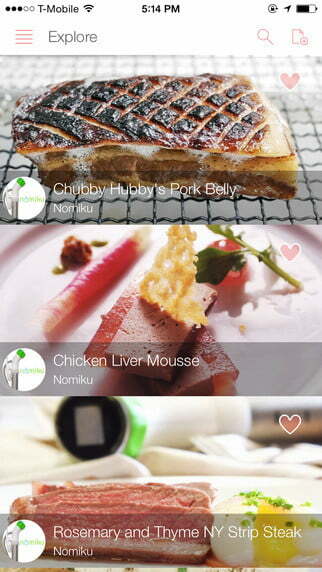 If the app let you select the type of meat, cut, and thickness, it would bolster its usefulness. That’s a little warmer than you want your water if you’re going to sous vide a steak. Serious Eats has a handy chart for cooking steak sous vide based on type, thickness, and doneness. 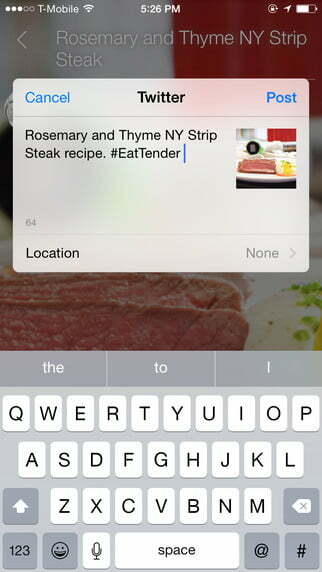 It came in handy because the Tender app isn’t exactly bursting with recipes. Many are user-submitted, and there doesn’t seem to be a universal standard. For example, one recipe we found for char siu pork tenderloin (Chinese barbequed pork) had everything in grams. It’s all well and good if you have a kitchen scale, but there doesn’t appear to be a way to convert the recipe into your preferred measurements in the app. Another recipe we found had no measurements whatsoever, just an ingredient list. 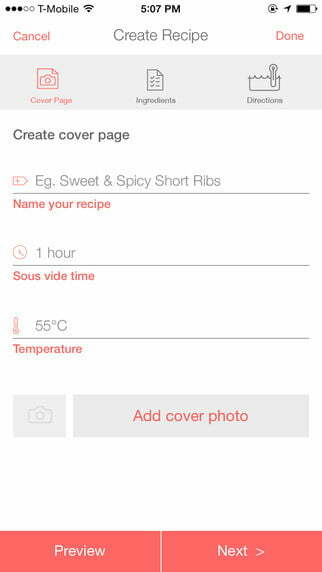 That the Tender app isn’t chock full of flawless recipes isn’t a deal-breaker. 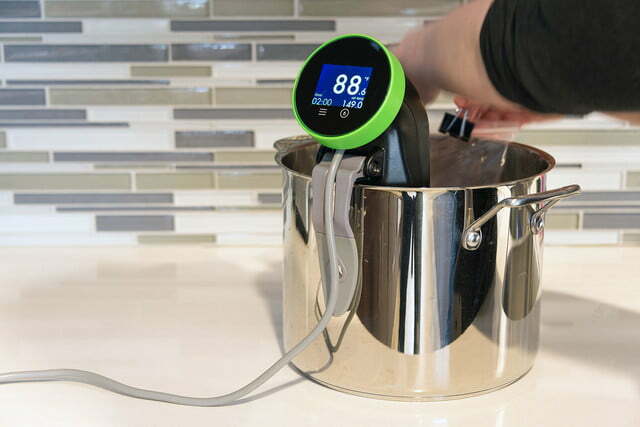 There are plenty of sites — and other apps — that can take you through the basics of sous vide. And there are two ways to go it alone when it comes to setting the time and temperature on your Nomiku. You can use the app by going to My Devices in the menu, selecting your device, and hitting the plus and minus buttons until you get to your desired temperature, then scrolling through a menu of hours and minutes. Or you can just use the wheel. Turning the circulator’s green dial slowly lets you make changes by 0.1 degrees, while more vigorous spins takes you through the numbers more quickly, though there are a lot of degrees to get through when you’re using Fahrenheit. Once you have the temperature set, hit the menu button, use the wheel to scroll to the set time option, then use the action button to get back to the main screen. You use the dial again to set your time, then hit the action button twice to start up the machine. The app is much easier than this somewhat arduous process. When you find something you want to make, you simply hit the “cook this” button, then hit start. 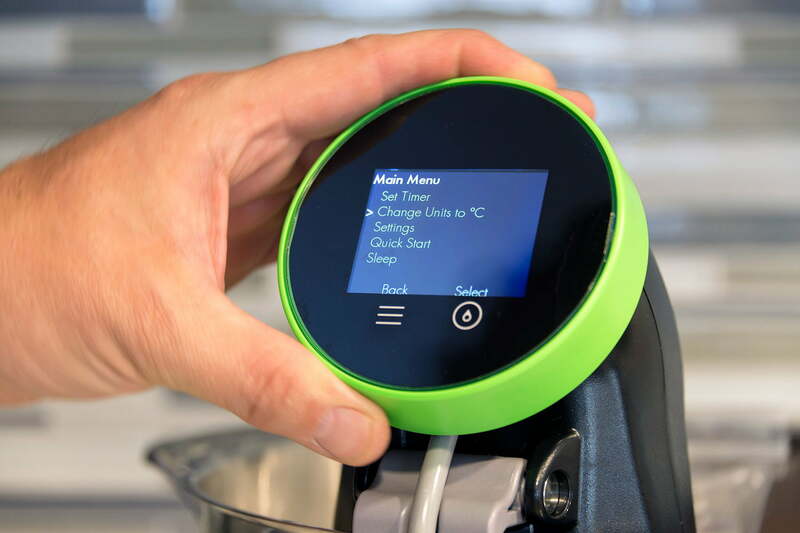 The Nomiku kicks on, heats the water to your desired temperature, and then you hit “continue” to set the timer. The app also had some quirks. Setting the device’s units to Fahrenheit didn’t trigger a switch in the app, and we had to actually shut the app down and start it back up to get them to change. Using thermometers to check the temperature, we found the Nomiku to be very accurate, within about 0.5 degrees Fahrenheit and often much closer. This meant that everything we cooked, from scrambled eggs to burgers to pork tenderloin, turned out as promised — though sometimes these were based on suggestions from other sites and apps. 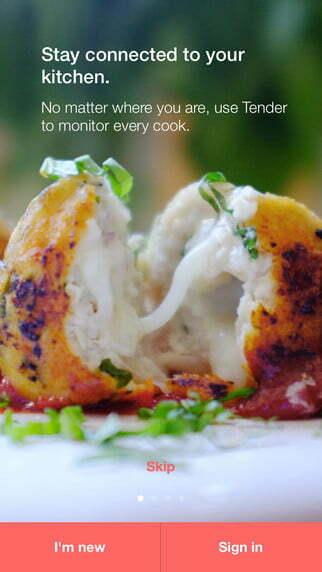 It made us wish the app simply had simple-to-follow guidelines in addition to its recipes. If you just want to make chicken breast, for example, and it let you select the type of meat, cut, and thickness — as the GE Paragon’s app does —the app would be more useful. It’s hard not to compare the Nomiku to the Anova, and the former’s recipes don’t compete. Tender has about 20 chicken recipes, and we stopped counting at about 50 on Anova’s app. When it comes to cleanup, Nomiku wants you to use the self-cleaning method, sort of like a blender: Get a fresh pot of water and some soap, and let it circulate 149 degree Fahrenheit (65 degrees Celsius) H20 for 10 minutes. The Nomiku is quick to heat up and holds temperature well. It’s bulkier than its predecessor and a lot of its competitors, but we were still able to use it in a sauce pot with no problem. And the hardware works well overall, despite a bit of a time-consuming setup. 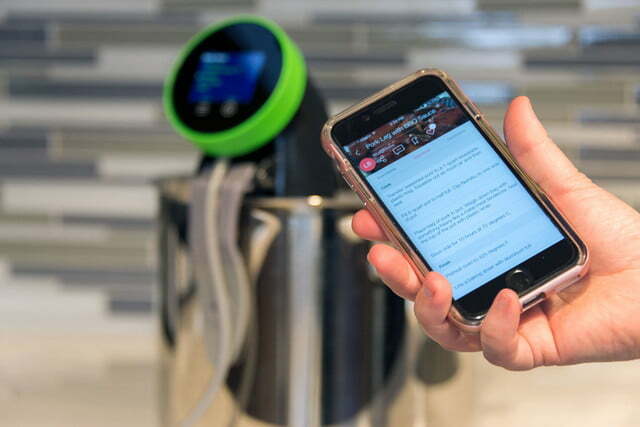 It’s really the app that might leave you cold here, but with cookbooks, sites, and apps dedicated to sous vide, it might not be a dealbreaker to venture out and find more recipes. It’s on sale for $199 right now, a very good deal. But when the price rises to $249, new sous viders would be wise to search for something cheaper.